Artist Nancy Hiss is creating an art work that consists of drawing the names of all dead US and coalition men and women. The names are threading their way through the fabric of Portland OR. Only last names are listed to honor the sacrifice of individuals & their families. As you reflect on these names also remember the hundreds of thousands of nameless Iraqis and others who have been scarred by this war. 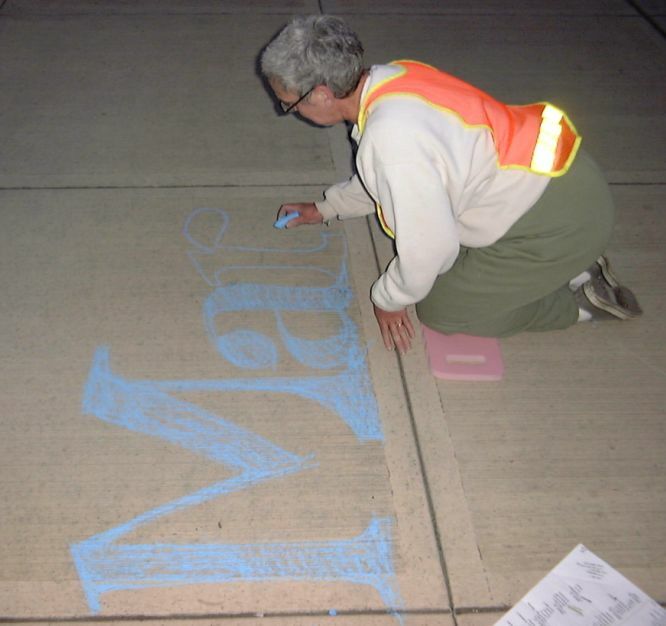 On Memorial Day of 2007, I knelt down in front of the Edith Green Wendell Wyatt Federal Building and wrote March 21, 2003 in chalk. As I was writing two guards walked out and watched over me. When I finished they asked, “March 21? What is that?” I responded, “That was the first day that a soldier died in the Iraq war.” I handed them a written description of the project and they walked away. Then I wrote; Aubin, Beaupre, Cecil, Childers, Evans, Gutierrez and on and on. To date, I have written over 4,000 names covering over 14 miles. The Iraq Names Project is a memorial, a demonstration, a personal cleansing; it is an act to honor sacrifice and to recognize interdependence. The concept is so simple it can be explained by a five -year old. The act is so simple it can be shared by Girl Scouts, eighty year old women, students, friends, neighbors, passersby, draft age boys, survivors of Nazi Germany, veterans, everyone. Over 100 people have knelt down with me on the sidewalk to share in this experience. Some people chalk in one name. Some people come back week after week. People are drawn to the aesthetic of the beautifully drawn names. Many are amazed that it spans so many miles. Many say that it is powerful. Some are moved to tears. Some stop to tell stories. One young man asked what I was doing. “I’m writing the names of the U.S. and international coalition forces who have died in Iraq.” He responded “You just wrote my name, Rivers.” There was a long silence while the hairs stood up on the back of my neck. “I’m glad it’s not you.” “Yea, me too.” Names are very powerful. Dates are very powerful. Only last names are written to acknowledge the loss, not just of individuals, but of families. Oregonians are written in white, all other names are written in colors. It is neutral. It is inclusive. It is a way to share in sacrifice. It is an act of peacemaking. When it rains the names and dates are washed away, symbolic that these people are gone. Nancy, you done good and keep doing it. i see no need to ” honor ” anyone who chose to make war a career . they singed a contract basically accepting a salary in exchange for the possibility of their death . period. if you want to use the chalk paint for stencils youll need to cut them from some plastic or mettle, the stuff is thick enough where youll want to wipe it off the stencil for heavy usage but it will soak into cardboard after a short amount of time. Lucy 4, it just isn’t that sample. Yes, it is a volunteer army, and, yes, we must assume that at least some of those volunteers knew full well what they were getting into. But the truth is that for many service persons, the military is one of the only ways they have to better their circumstances. Combine that with a recruiting process that deliberately conceals the harsh reality of military life (and death), and the result is an awful lot of very young kids thinking that all they have to do to get a college education is serve a few months in a non-combat position far from the battlefield. Remember Private Benjamin – “I didn’t join this Army; I joined the one with the condos and the hot tubs.” – well, sad to say, that’s not too far from what can really happen. But no matter how you view the choices made by those who enlisted, none of them deserve what is happening to them now. The choice you should decry is the choice our Adminstration made to invade Iraq and set off what appears to be these troops’ endless sacrifice. This is a remarkable project and effort. Regardless of your political position or your view of the war in Iraq, those who did sacrifice their lives deserve the tribute and rememberance this project creates. And thank you for also remembering the countless Iraqi’s who have died, been wounded or displaced by the violence. War is horrific, sometimes unavoidable, but always horrific. It’s never wrong to make people stop, think and remember. The Iraq Names Project was on the news recently, and I’m glad to have found this blog. Listing the family names of those killed is a great idea, one which will perhaps have an impact on those who still believe that our being in Iraq and Afghanistan is a good thing. Whenever I see that someone is honoring dead servicemen and women, I am saddened that no one seems to be acknowledging the terrible price which Iraqi and Afghani civilians are paying for our involvement in their countries. On this blog’s “About” page is the sentence, “As you reflect on these names also remember the hundreds of thousands of nameless Iraqis and others who have been scarred by this war.” This is a good first step. But in addition to chalking names on sidewalks, why not also chalk numbers of civilians killed each day? That would make an even greater impact.